The theme for Dec 2018 Short Stories is "Suspense". Your contributions can be submitted in the submission form to all categories from 15th to 25th of each month. Only the theme based stories will be considered for Short Stories. More details are on the notice board. We have 7 new writers who joined IWW recently, and they are - Sangeeta Saha, Shashi Soreng, Alfisha Siddiqui, Devanapalli Veenavani, Ghazala Javed, Kanjika Ram, and Himanshi Shukla. There were many stories and poems from new writers, but I could not accept them for not following our simple rules. 3. 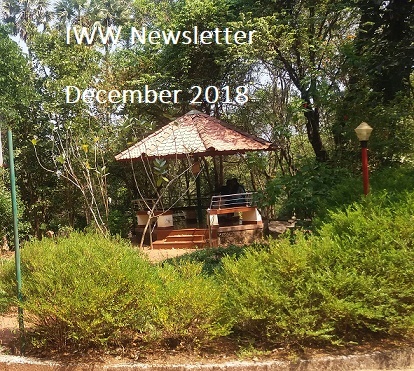 New items published at IWW in Nov 2018. (a) On a Dark Night(b) Woman of Soil(c) Dhara. The Use of "EXIT" Philosophy in Practical Life . c) Castle Craig’s 30th Anniversary – International Essay Writing Competition -Last date - Dec 30, 2018Castle Craig Hospital in Scotland is holding an international essay writing contest to celebrate their 30th anniversary. It is inviting students who are studying medicine, psychology, nursing, psychotherapy and social work.